Recent research shows that the foreign born utilize both local and long-distance social relationships to become entrepreneurs, affecting immigrants’ chances at upward mobility and their contributions to economic development. Scholars have yet to assess how African-American entrepreneurs take part in similar types of geographically dispersed business communities. Using multi-level social network analyses and OLS regressions to compare the geography of buyer-supplier ties originating from one immigrant neighborhood and one African-American neighborhood in Chicago, this paper highlights a unique mechanism that places African Americans at a disadvantage compared to immigrants: a lack of geographic diversity in African-American social capital. Immigrant entrepreneurs’ social networks, unlike African Americans’ networks, connect the foreign born to more people in different places, enabling them to circumvent the limitations of their local communities and accrue more business assets. Contrary to existing research, many foreign-born business owners in this study relied on intra-national rather than local or transnational social ties. These findings challenge researchers to reevaluate the geographic foundations of immigrant and African-American entrepreneurship and reexamine how ethnic minority entrepreneurship affects patterns of social stratification and economic development. 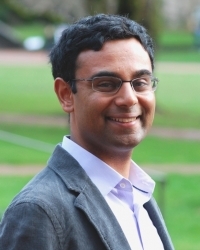 Mahesh is a Postdoctoral Research Associate in the University of Washington Sociology Department. He received his PhD in Sociology at Princeton University in 2016. His core research agenda examines how retail growth and decline in urban and suburban areas affects patterns of social inequality and neighborhood change. His particular focus is on retail growth and decline in the context of immigrant entrepreneurship, gentrification, and health disparities. His research and teaching interests include urban studies, international migration, race and ethnicity, and spatial demography. For more information, please visit his website: http://www.maheshsomashekhar.com.